NOTE: If you cancel your subscription, upgrade or downgrade to a different plan, you may not be eligible for all of the features you had on your previous plan. First, log into your IBM Watson Media account. After you log in, click on your username in the upper right corner. Click on “Dashboard”. Then click on "Account" and select the Subscription tab. You will be taken to your subscription overview page. Then click on "Choose Another Plan". Click on the desired plan you would like to subscribe to. You will see a pop up confirmation box where you can click on “Change plan”. 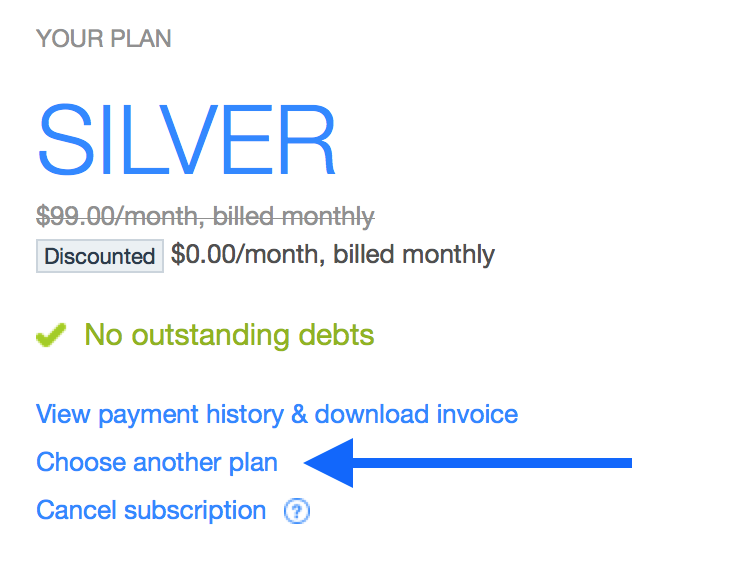 Click on "Change plan" to confirm your decision. If you have chosen to upgrade your plan, you will be billed the difference in price between your current and your upgraded plan, and will have immediate access to the enhanced features and extra viewer hours of your new plan level. Your billing date will not change, and your next bill will reflect the full price of your new plan level. If you have chosen to downgrade your plan, you will still have full access to all the features and viewer hours of your current plan level. Your plan level change will not take place until the end of your current billing period.